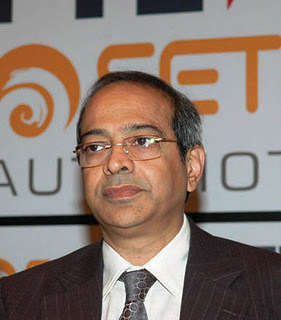 Harish Sheth, CMD, Setco Automotive Ltd.
Setco Automotive Ltd (BSE: 505075) counter on Tuesday witnessed a significant buy of 3 lakh shares by the FII, Morgan Stanley Asia (Singapore) Pte, which amounts to around 1.70% of the total shares in the company. This significant buy was undertaken by Morgan Stanley in BSE. StockExplain had earlier reported that Morgan Stanley had bought 1 lakh shares amounting to 0.57% of Setco Automotive on Friday. With Tuesday’s buy, Morgan Stanley has quadrupled its holdings in Setco Automotive within two consecutive trading days. The noted FII’s total stake in Setco now stands at 2.27%. The actual stake may be higher as only buys/sells above 0.50% stake need to be disclosed according to Indian rules. Morgan Stanley has invested Rs 6.96 crore in Setco Automotive stock during the last two trading days. Interestingly, and as was the case on Friday, there were no identifiable institutional sellers or promoters, as counterparties to the massive buy, which means that the significant purchase was picked up by Morgan Stanley from the wider market. And again as on Friday, despite the huge buying, Setco Automotive closed up by only 0.78% in BSE on Tuesday. The buying by Morgan Stanley was at an average price of Rs. 174, when the scrip was up by 0.59%. On Friday, Setco Automotive had closed up by only 1.32%, while Morgan Stanley’s buy was executed at Rs. 174 when the shares were up by 1.90%. Morgan Stanley’s continued buying is likely to have an impact on Setco counter, as, with a 2.27% confirmed stake, it has become the third largest non-promoter investor behind New Vernon Private Equity and Reliance Capital Trustee Company. With Tuesday’s buy, Morgan Stanley’s stake has surpassed that of Ares Diversified which held 1.36% stake as of Q3 end. Setco Automotive has opened at Rs. 176.80 on Wednesday, up by 1.41%, and is now trading up by 2.09%.